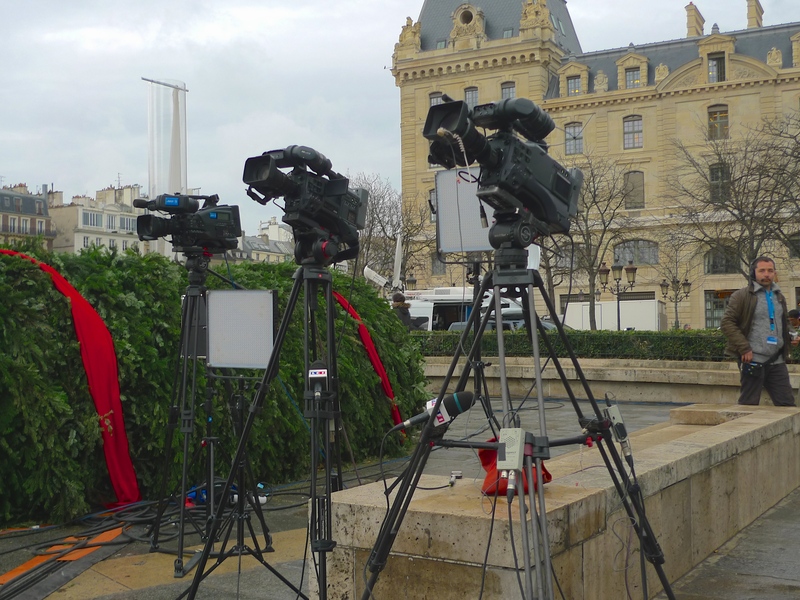 Shortly before 11.00 this morning I arrived in Place Jean-Paul II, the open space in front of the Cathédrale Notre Dame de Paris, to find that it was home to a selection of the world’s media. Radio and TV broadcasters were busy establishing satellite links with their studios and preparing to broadcast ‘live’ to their audiences around the world. Yet twenty-four hours earlier the media would have been hard pressed to find a story here – any story – let alone a story worth reporting. But then, in what seemed like the blink of an eye, everything changed. Shortly before 11.30 yesterday morning, 7th January, two masked gunmen armed with Kalashnikov rifles and a rocket-propelled grenade launcher stormed the headquarters of the French satirical newspaper Charlie Hebdo in rue Nicolas Appert in the 11th arrondissement of Paris. They shot and killed twelve people, including eight Charlie Hebdo employees and two police officers, and wounded eleven others. After the news broke, there was an outpouring of sympathy for the victims, support for freedom of speech, and defiance against the perpetrators. 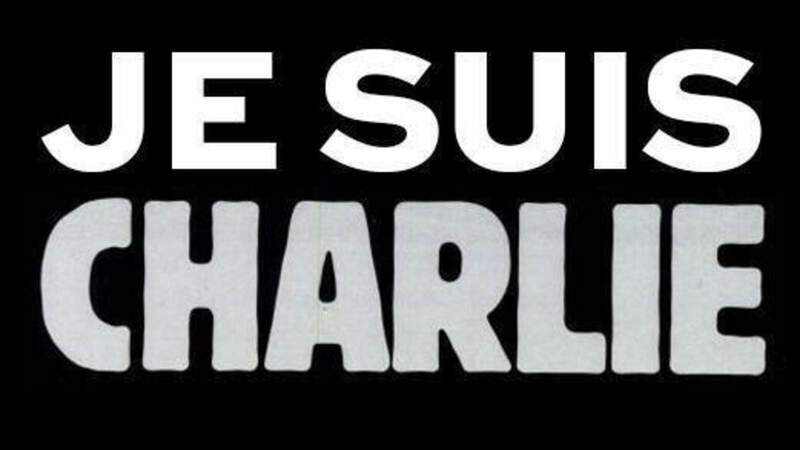 The symbol for all this became encapsulated by the declaration, “Je Suis Charlie” (“I am Charlie”). 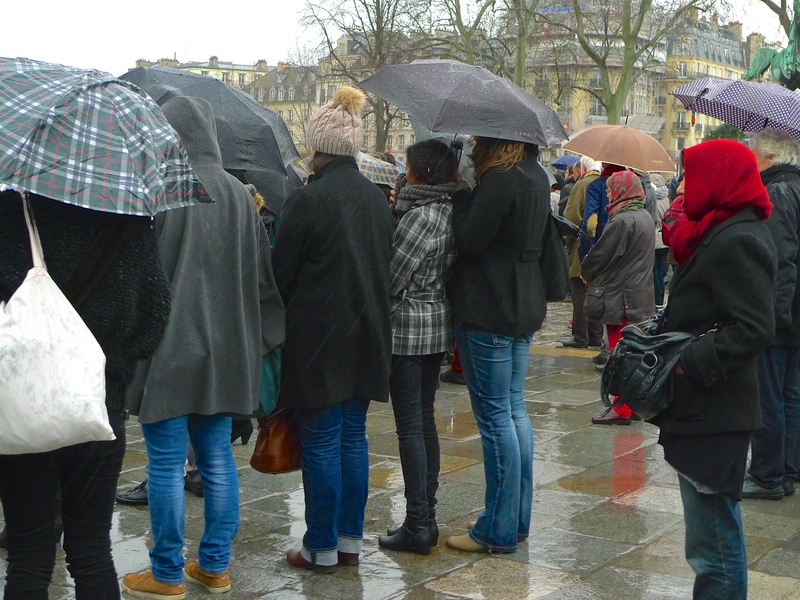 At midday today people in Paris and across France paused for a minute of silence to mourn the victims of the Charlie Hebdo attack. 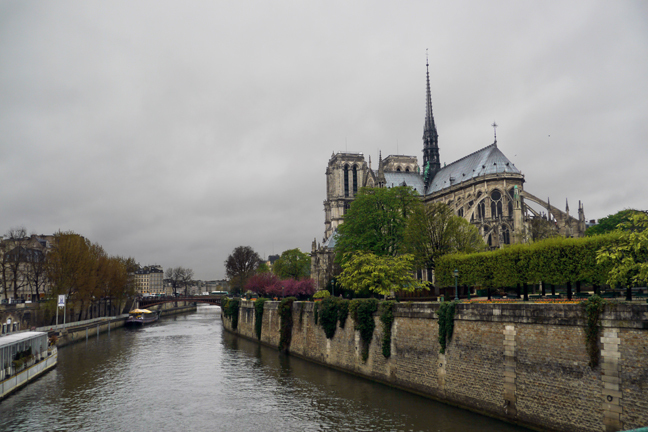 In declaring today a day of national mourning it was decreed that flags on all public buildings should be flown at half mast and that the bells of the Cathédrale Notre-Dame de Paris should be rung in honour of the victims. 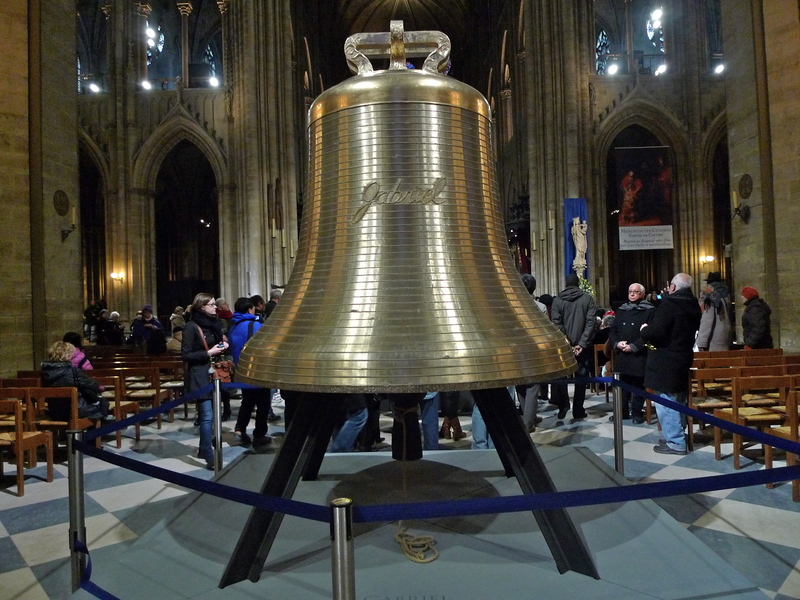 After the silence the bells began to peal again and they did so for a further twenty minutes. 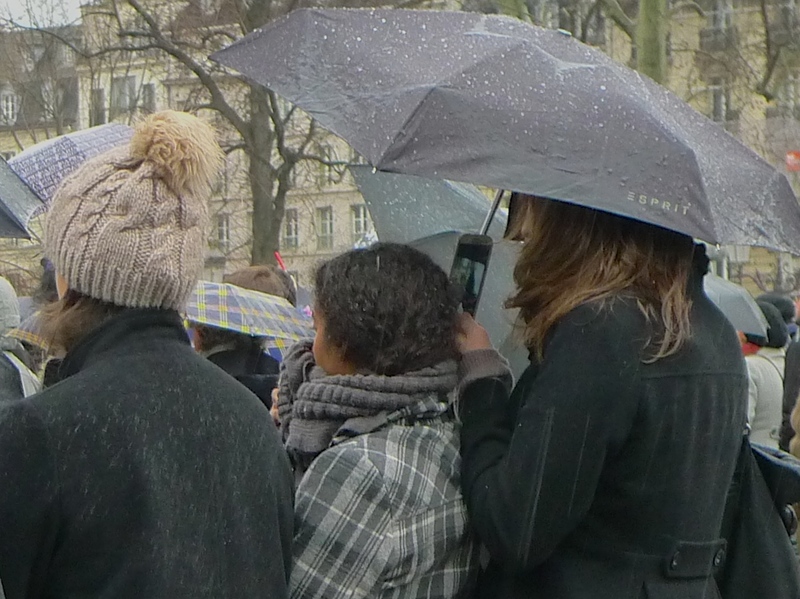 Despite the heavy rain, practically everyone stayed until the bells had finished after which there was spontaneous applause. It seemed to me that the silence, surrounded by the sound of the bells and the sound of the rain falling like tears from the sky said everything that needed to be said. The remaining staff of Charlie Hebdo have announced that publication will continue, with next week’s edition of the newspaper to be released as usual except that, with eight pages, it will be half its usual length – but it will have a print run of one million copies compared to its usual 60,000. 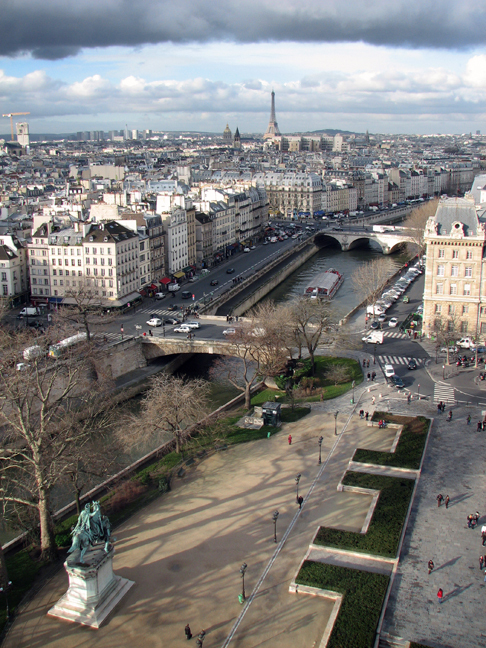 FOR THE LAST FIVE years or so I’ve been recording the contemporary sound tapestry of Paris in, as far as I know, a more comprehensive way than it’s been done before. During that time I’ve recorded both the ordinary and extraordinary sounds of this city in ordinary and extraordinary places. Occasionally, I’ve been able to record history in the making and last Saturday was one such occasion. It was quite sobering to think that the event I was about to witness will never be seen again in the lifetime of anyone who was there. 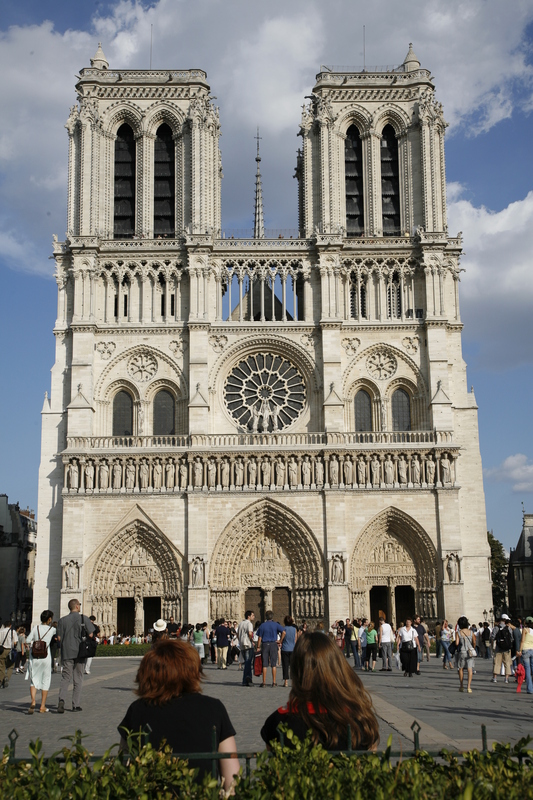 Bells have rung out from the Cathédrale Notre Dame de Paris since the end of the 12th century, long before the building of the cathedral was completed. As the cathedral’s life evolved and its influence developed more bells were added to reflect its increasing importance. 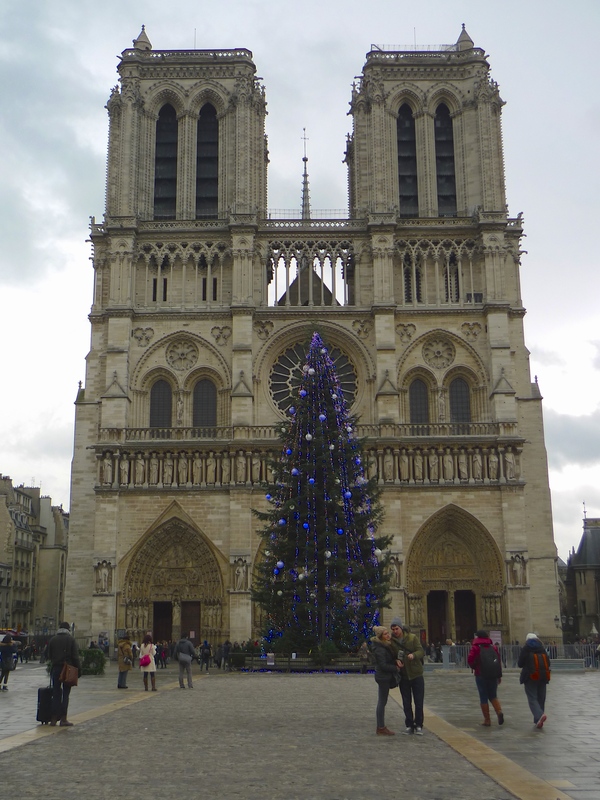 By the middle of the 18th century Notre Dame had a magnificent array of bells – eight in the north tower, two bourdons, or great bells, in the south tower, seven in the spire and three clock bells in the north transept. But their days were numbered. 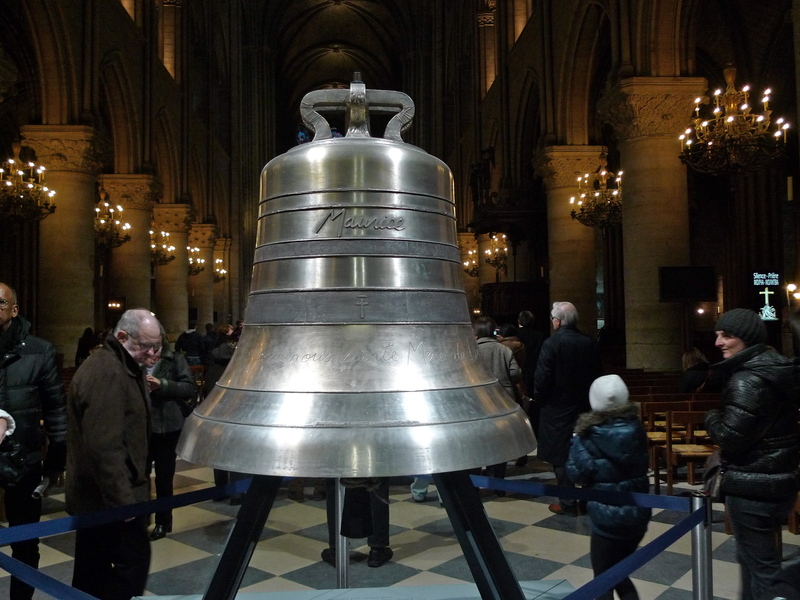 The ravages of the French Revolution took their toll and the bells were removed, broken up and melted down. One bell though escaped this destruction. 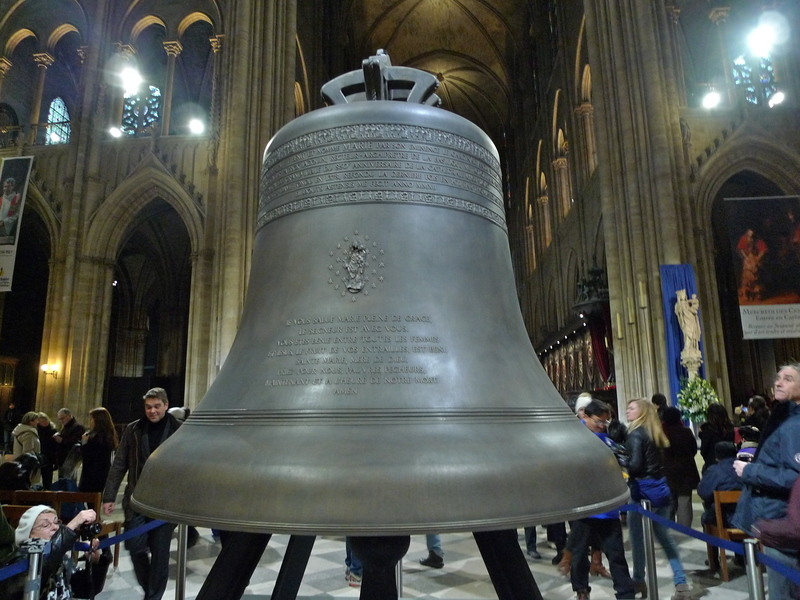 The biggest of the cathedral’s bells, the great Emanuel bell, was saved and reinstalled on the express orders of Napoleon I and it still sits in the south tower today. 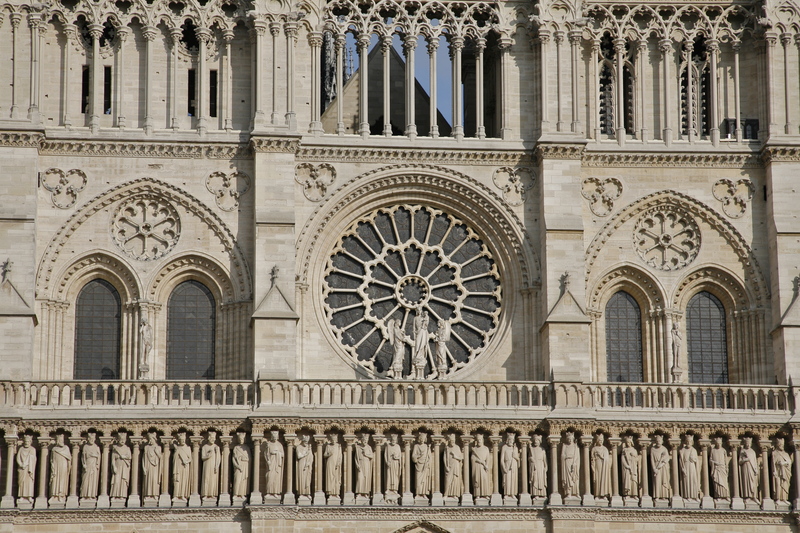 After the dust of the Revolution had settled new bells were installed in Notre Dame – four in the north tower, three in the spire and three in the roof of the transept. Unfortunately, the best that can be said about these new bells is that they were second rate. Poor quality metal was used to cast them and they were out of tune with each other and with the magnificent Emanuel bell. 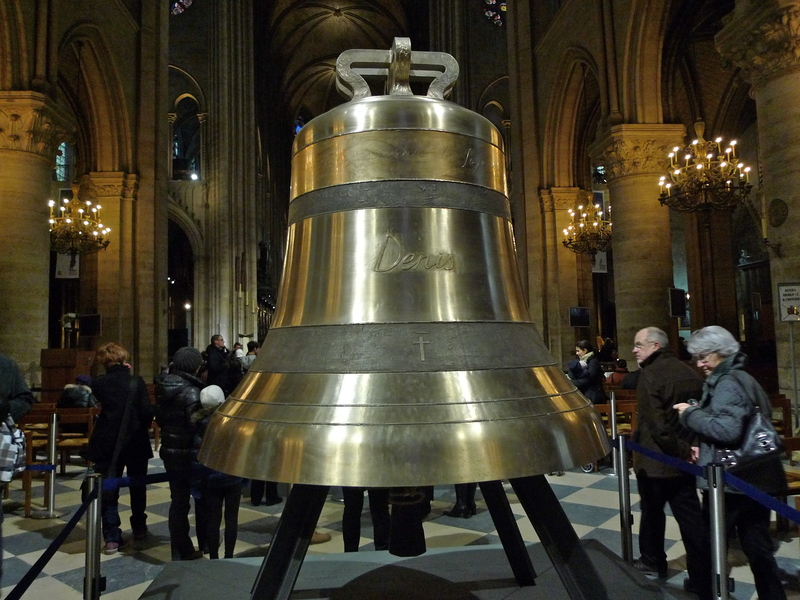 And these second rate bells are what Parisians have lived with, at least until last Saturday – and then everything changed. 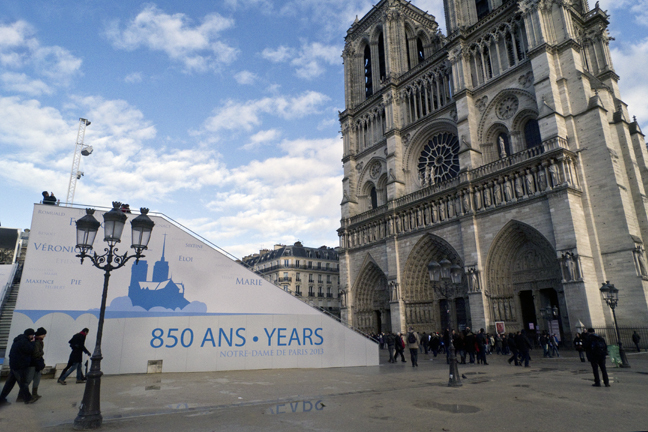 To mark the 850th anniversary of the founding of the Cathédrale Notre Dame de Paris it was decided to replace the existing cathedral bells with new ones, exact replicas of the bells that were in place before the Revolution. 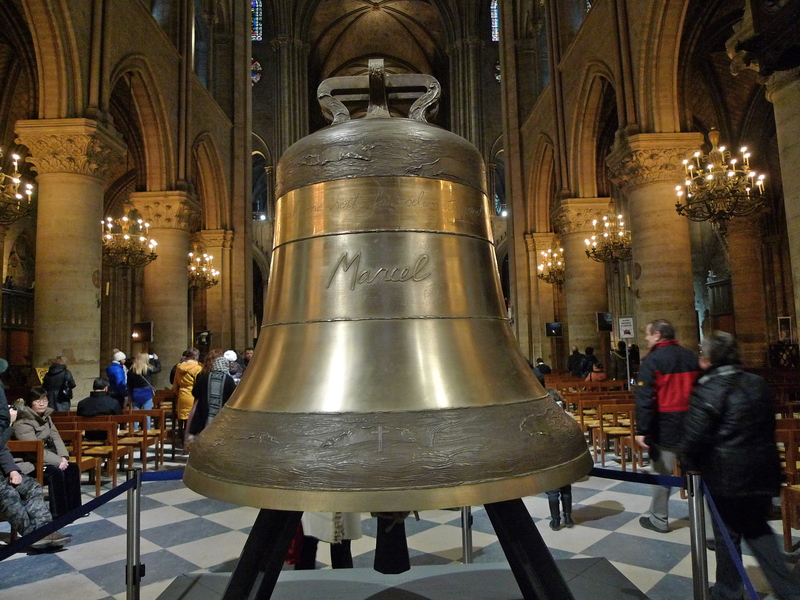 With eight new bells in the north tower cast at a foundry in Normandy and a new bourdon cast in the Netherlands sitting beside the frail and now very carefully used Emanuel in the south tower, once again the soundscape of 18th century Paris can be recreated and sounds that have been lost for over two centuries can again be heard. 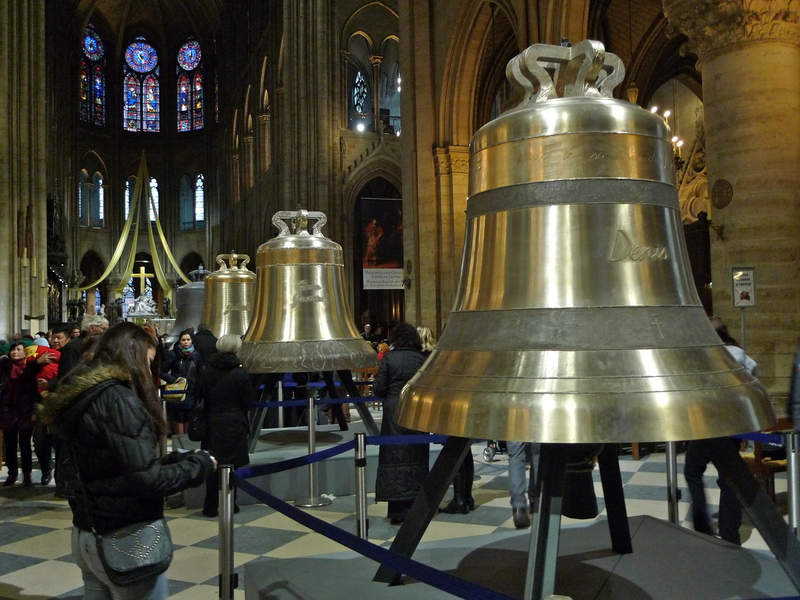 In February, the new bells were delivered to Notre Dame and were blessed by Cardinal Vingt-Trois. They were then set out in the nave of the cathedral for the public to see and to touch. I saw and touched them all. 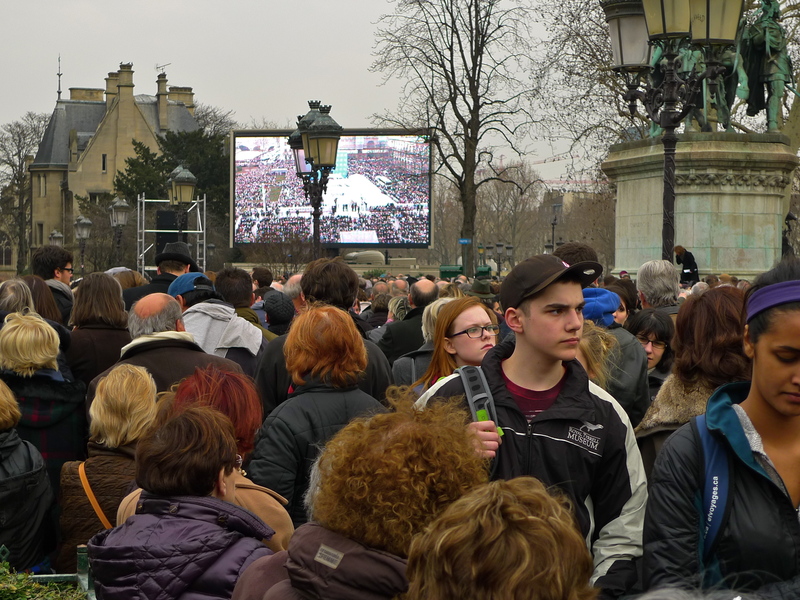 I was there on the Parvis du Notre Dame or as it’s called today, Place Jean-Paul II, as the crowds gathered and the anticipation mounted. The dignitaries arrived and proceedings got underway with three chimes from the great Emanuel bell which brought a gasp from the crowd. 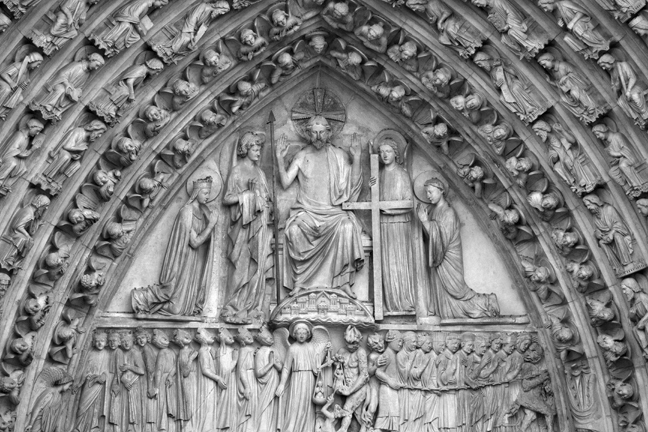 Singing by children from the Sacred Music Choir of Notre Dame was followed by an explanation of what was to happen next by a lady whose French was impeccable and whose English accent was far from perfect but nevertheless, an absolute delight to listen to. Cardinal André Vingt-Trois, Archbishop of Paris, recently returned from the Papal conclave in Rome, then gave a short address. 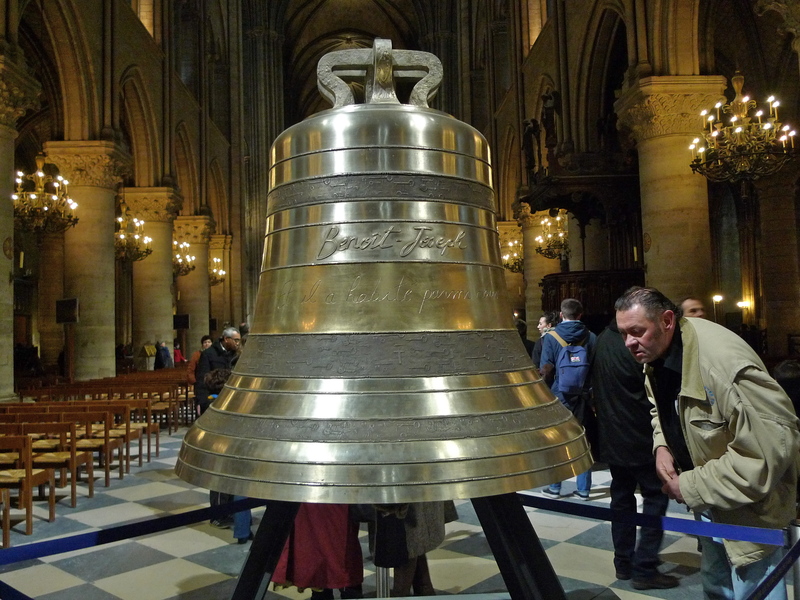 The smallest of the new bells, Jean-Marie, in memory of Cardinal Jean-Marie Lustiger, the 139th archbishop of Paris, from 1981 to 2005. 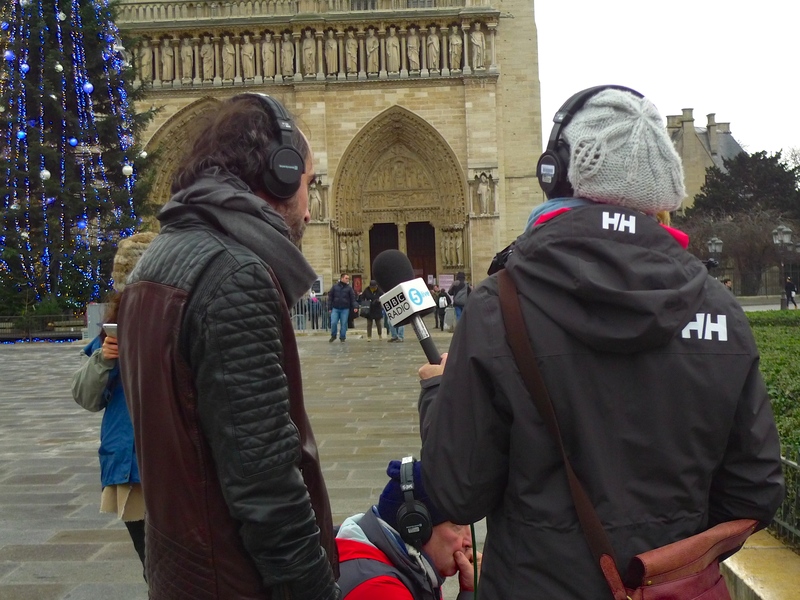 When the Cardinal finished speaking there was an eerie silence and then the moment came – the very first ringing of the new bells of the Cathédrale Notre Dame de Paris, sounds that haven’t been heard for over two centuries. 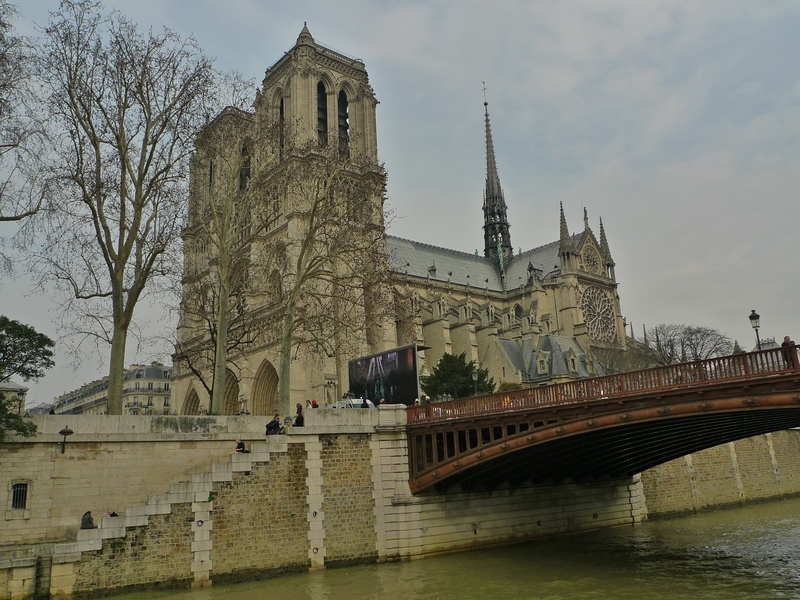 Maurice, in memory of Maurice de Sully, the 72nd bishop of Paris, from 1160-1196, who launched the construction of the current cathedral in 1163. After that historic and quite breathtaking experience, which kept the crowd spell bound, it was the turn of the Mayor of Paris, Bertrand Delanoë, to speak which he did fluently and without notes. Benoît-Joseph, in honour of Pope Benedict XVI. Joseph Ratzinger was made Pope in 2005 and retired in 2013. Then came quite remarkable sounds from the bells, a conversation between the smallest bells and Gabriel, one of the largest. Étienne (Stephen), in honour of Saint Steven, the first Christian martyr. 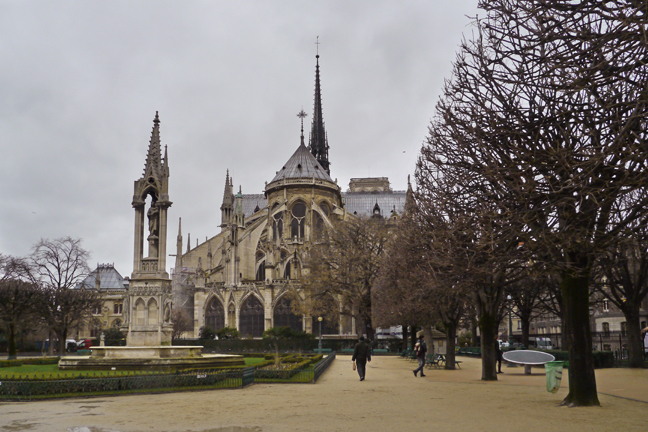 The church constructed (from 690 AD onwards) on the same site as the current Cathedral bore the name Étienne. Next to take to the podium was Aurélie Filippetti, Ministère de la Culture et de la Communication. Marcel, in honour of Saint Marcel, the ninth bishop of Paris, at the end of the 4th Century. 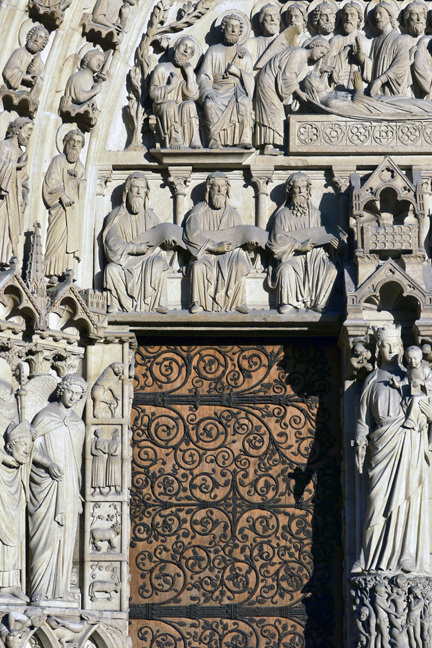 Denis, in honour of Saint Denis, the first bishop of Paris, c. 250 AD. He is the patron saint of the diocese. 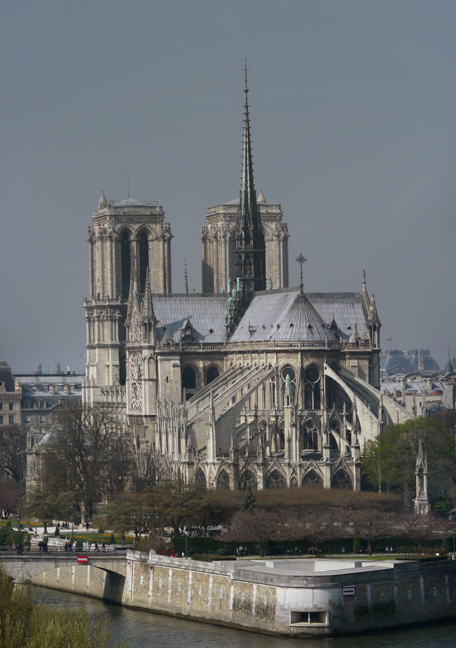 Over the centuries, the sounds of the bells of Notre Dame have told of the joys and sorrows of the Christian community and the major moments that have marked the history of France. Anne-Geneviève; in honour of Saint Anne, the mother of the Virgin Mary and in honour of Saint Geneviève, the patron saint of Paris. Hearing the sounds of the new bells for the first time was a very special moment but more was to follow. 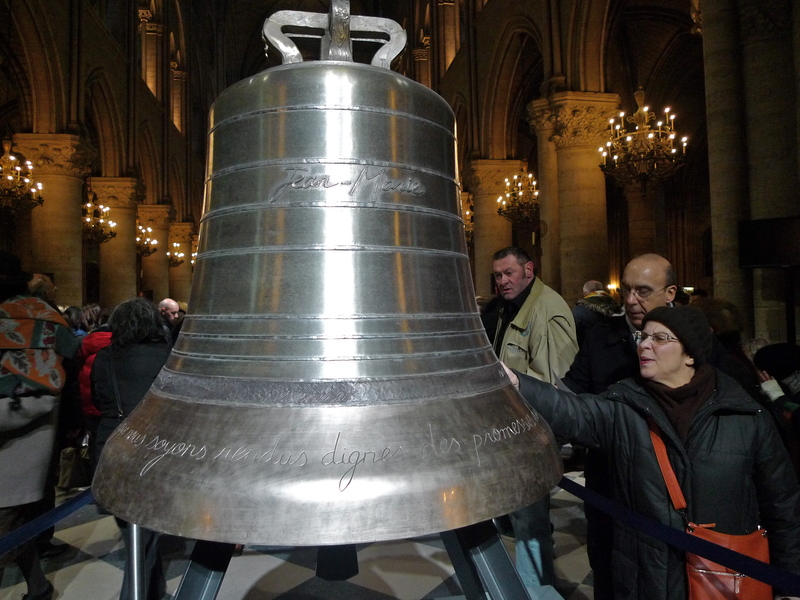 Introduced by Monseigneur Patrick Jaquin, recteur-archiprêtre de la Cathédrale Notre-Dame de Paris, the climax of the ceremony was a magnificent grande solenelle, all ten bells ringing at once. Gabriel, in honour of Saint Gabriel, who announced the birth of Jesus to the Virgin Mary. 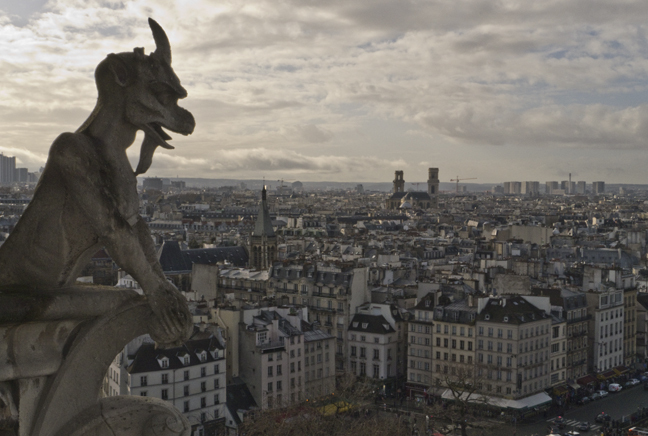 In the 15th Century, the largest of the North Tower’s bells already bore the name Gabriel. Bells have been associated with Christianity since its earliest times and, although they have marked the passage of time, their primary purpose has always been liturgical. Their chimes summon people to come together and call them to prayer. 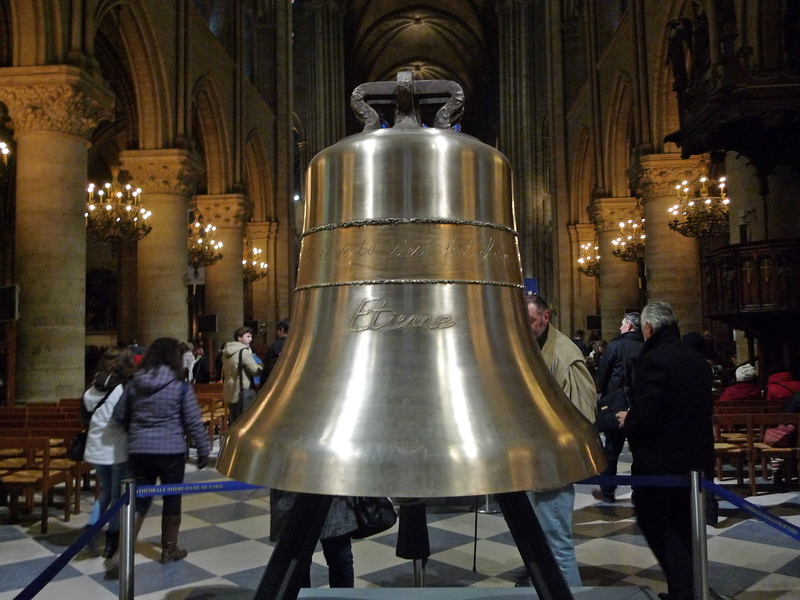 It seems appropriate therefore that I should conclude with the sounds of the new bells at Notre Dame doing just that – calling people to the evening service in the cathedral just as they have done for hundreds of years. And it was quite special to know that the sounds engulfing the Place Jean-Paul II and beyond were the same sounds heard over two centuries ago. 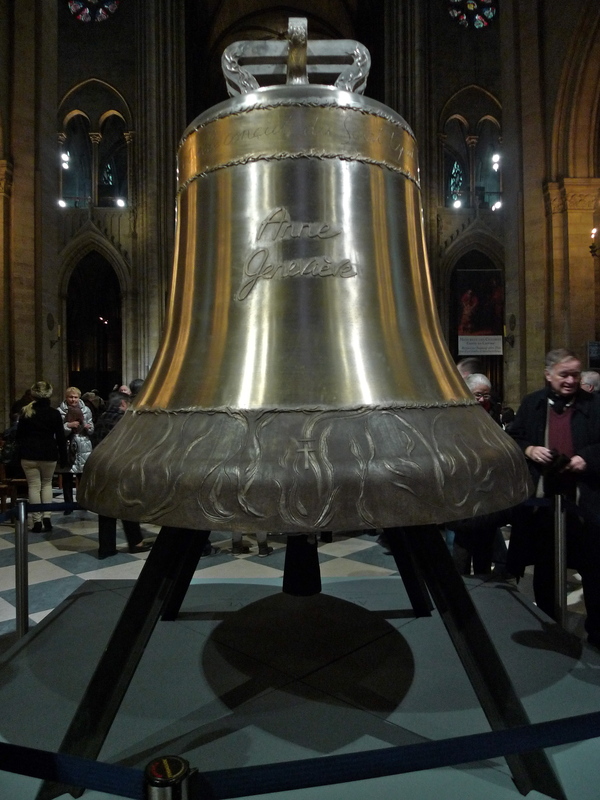 Marie, in honour of the Virgin Mary and in memory of the first great bell of the Cathedral, which was cast in 1378. 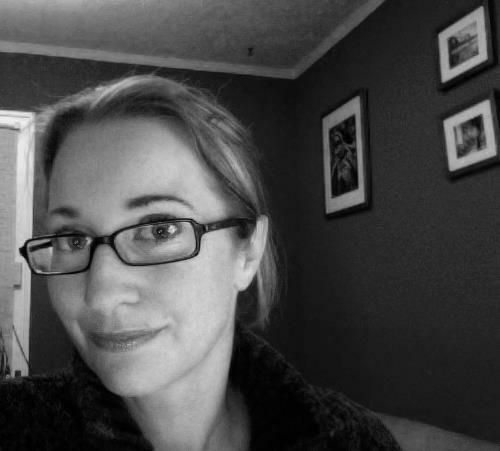 I AM PASSIONATE ABOUT recording and archiving the everyday sounds around me. I record anything and everything. But even I have a couple of self-imposed rules I try to adhere to – I never record people’s private conversations and I never record people at worship. To record private conversations is simply wrong and, it seems to me, the act of worship is a personal and private thing and to record it would be an unforgivable intrusion. Yet, last Saturday, I broke the second rule and recorded an act of worship! My excuse for doing so was that this was a very public act of worship broadcast live both on television and on radio. It took place in the Cathédrale Notre-Dame de Paris and, according to the order of service, it was a Messe d’action de grâce pour la beatification de Jean-Paul II – a mass to celebrate the beatification of Pope John-Paul II. The Cathedral was full to the rafters so, by the time I got there, it was standing room only. The mass was presided over by no less than the Archbishop of Paris, Cardinal André Vingt-Trois. He was appointed Cardinal by Pope Benedict XVI in November 2007. 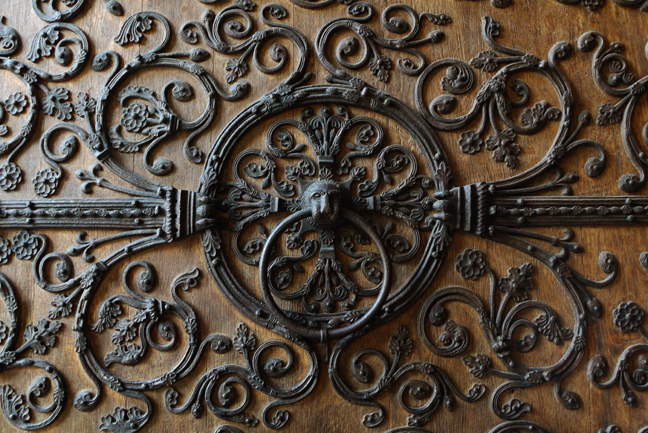 Regular readers of this blog will know of my love of the wonderful creations of the master organ builder, Aristide Cavaillé-Coll. The organ of Notre Dame de Paris that we see and hear today is a Cavaillé-Coll creation built around the François-Henri Clicquot 18th century organ. Over time the organ has been restored, modified and upgraded and today it even makes use of state-of-the-art computer technology. 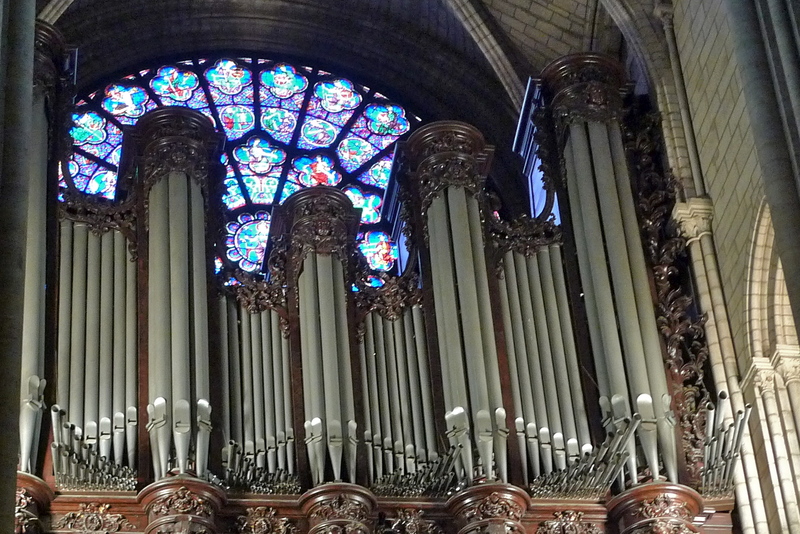 With five keyboards and close to eight thousand pipes it is the largest organ in France. Louis Vierne, Léonce de Saint-Martin and Pierre Cochereau have played this organ – immortal names in the world of Cathedral organists. Imagine then the thrill of listening last Saturday to Jean-Pierre Leguay, Organist Titulaire de Notre-Dame, playing this ‘King of Instruments’ as the ecclesiastical procession left the cathedral with Cardinal André Vingt-Trois bringing up the rear. 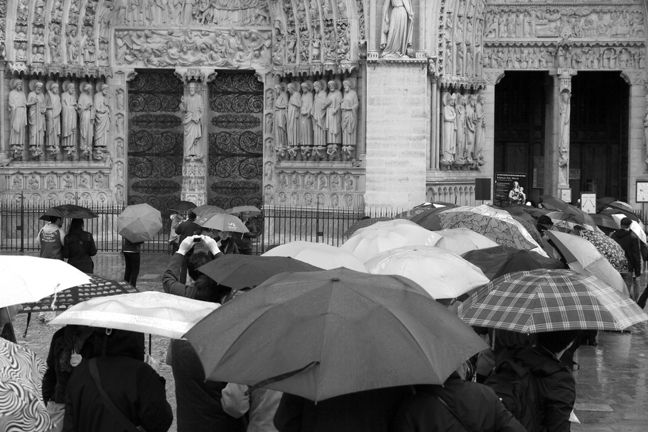 Around a thousand people, me included, followed the procession bathing in the majestic sounds of the Grand-Orgue de Notre-Dame. For everyone else this was a celebration of the beatification of Pope Jean-Paul II – but for me it was a celebration of the genius of Aristide Cavaillé-Coll.